It’s that dreaded time of the year again. Your webmaster’s visa has expired and he needs to go on a “visa run” to get a new permission to stay in Thailand. Same as six months ago, we’re going to Savannakhet in Laos to apply for a double-entry tourist visa and will do a bit of a trip report here. 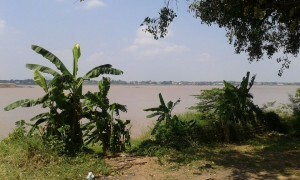 Why we’re going to Savannakhet? Because the Thai consulate in Savannakhet has an excellent reputation for issuing back-to-back double-entry tourist visa and is nowhere near as crowded as the popular consulate in Vientiane, the Lao capital. In fact, during our first visit six months ago we’ve met only one (!) other Farang at the consulate and visas were still issued on the same day as when you applied for them. 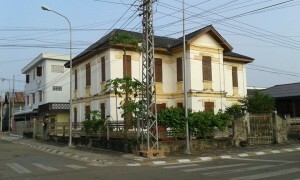 Unfortunately this has changed now and you need to stay one night in Savannakhet and wait for your visa to be issued. 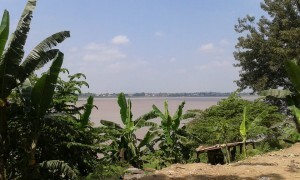 Savannakhet is located at the Mekhong river, just across the border from the provincial town of Mukdahan in Thailand’s northeastern Isaan region. 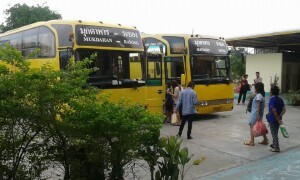 Mukdahan itself has no airport and flights to Savannakhet are pretty expensive, so we’ll be taking a so-called “yellow bus” from the bus terminal on North Pattaya Road (670 Baht one-way). What to do and what to see in Vientiane? Nothing really. 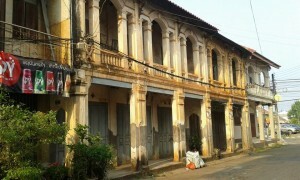 Savannakhet is the second largest city in Laos but really nothing more than a ghost town in ruins. Nightlife? Nope. 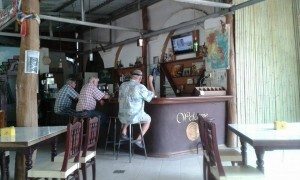 During our last visit we actually found only one bar/restaurant with a somewhat “Western” atmosphere, halfway decent food, free WiFi and reasonably priced Beer Lao. The lady owner told us there were two “noisy” discos somewhere on the outskirts of the city but we were too tired to check them out. 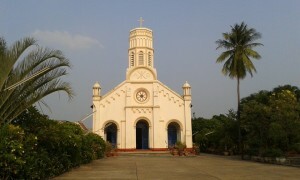 After what we had seen of Savannakhet during the day, we didn’t expect them to be the most happening places anyway. Embedded at the bottom of this post are some pictures taken during our first visit to Savannekhet in October 2014. 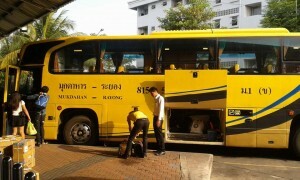 We’re leaving from Pattaya pretty much on time and just a few minutes past 8 a.m. 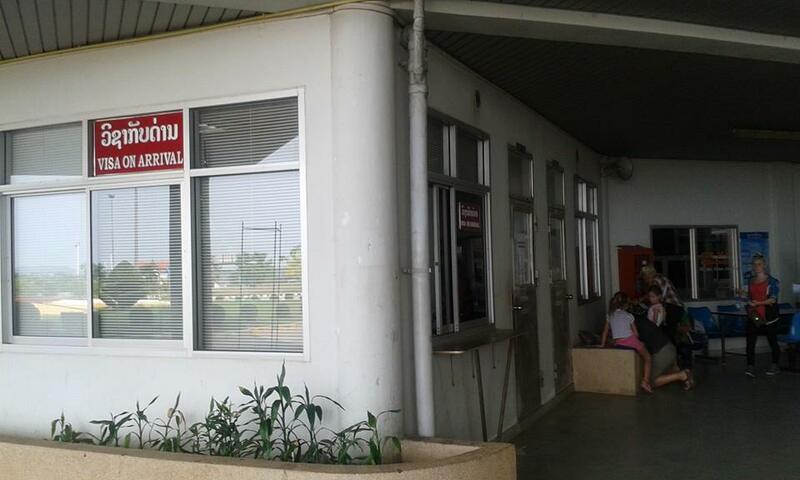 The scheduled arrival time in Mukdahan is 10 p.m. To say I’m looking forward to this trip would be a euphemism. I’ve booked the bus ticket a day in advance. 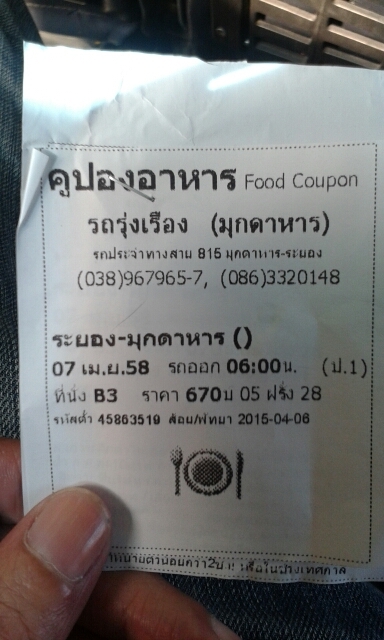 The one-way fare is 670 Baht and the departure time is 8 a.m., not 6 p.m. as stated on the ticket. 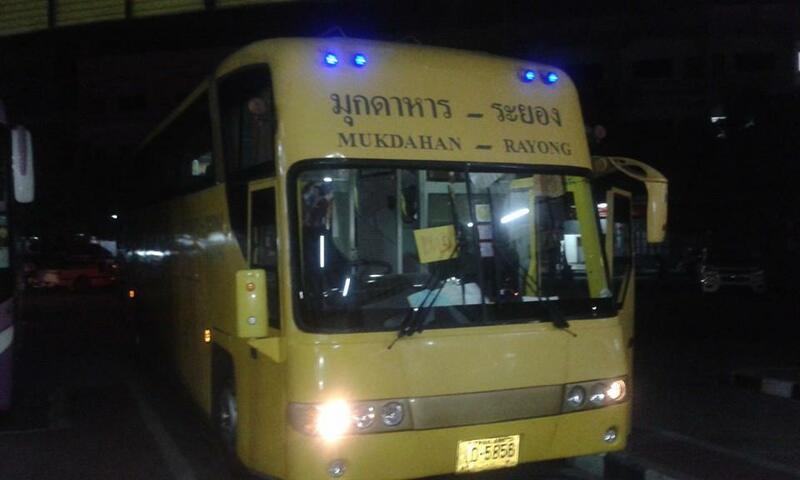 If you prefer to travel by night, more buses are departing from Pattaya in the evening. 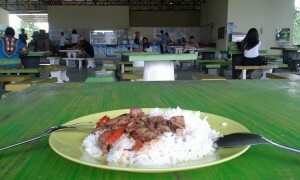 First 10-minute stop after 4 1/2 hours at the bus terminal in Sa Kaeo. Time for a pee and a much needed cigarette. 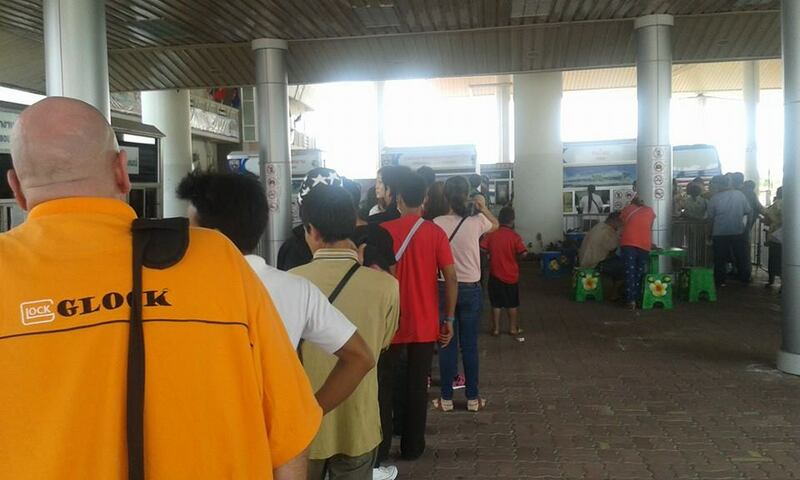 Still more than nine hours to go to Mukdahan – on paper. Second and last stop for the day. Half an hour at a bus terminal in the middle of nowhere in Buriram province. I’ve ordered some Isaan dish that looked halfway edible through the blurred glass window but emerged to be something like intestines and very very spicy. Also got to plug in my phone charger for a few minutes and managed to squeeze three cigarettes in. For some reason we also changed the bus but the aircon is just as lousy as in the first bus. Still something like six hours left till Mukdahan I guess. 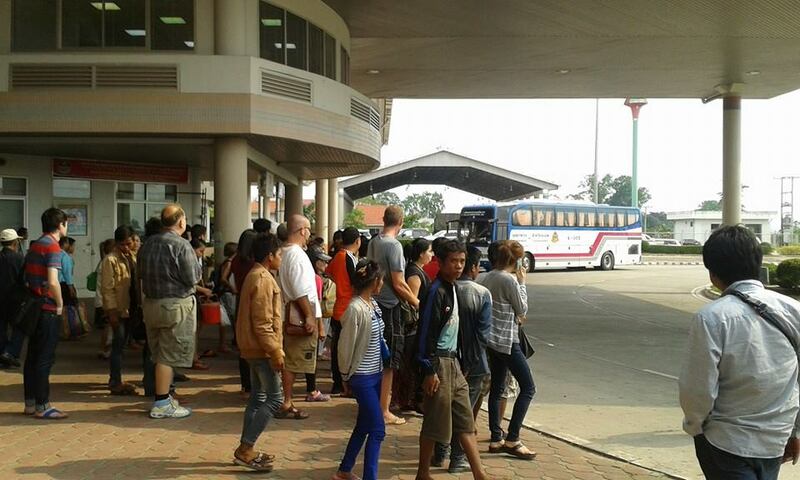 Hadn’t the scheduled arrival time in Mukdahan been something like 10 p.m.? It’s nearly a quarter past midnight when we eventually arrive at the Mukdahan bus terminal. More than 16 and mostly sleepless hours on a bus with an outdated aircon system. Now how about a meal and an ice cold beer? No chance. All restaurants and shops in the area are closed and the nearest 7-Eleven, I’m told, is within a walking distance of at least 15 minutes. Other than during the day probably, there’s not even an annoying tuktuk driver or motorcycle taxi around that would talk me into visiting some crappy karaoke. No, this is obviously not Pattaya here. Time to go to bed then it seems with an empty stomach and no beer. I take a room for the night – or what remains of it – at the so-called Submukda Hotel directly at the Mukdahan bus terminal (which is a convenient location anyway if you want to cross the border early enough in the morning to make it to the Thai consulate in Savannakhet before 11 a.m.). 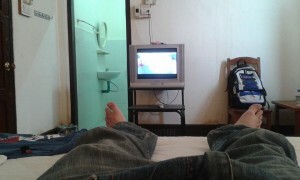 Decent aircon rooms with free WiFi are a reasonable 400 Baht a night (two pictures of my room are embedded just below). If you get off the bus just go back toward the exit of the bus terminal and keep left. You’ll find the hotel entrance in the corner there. 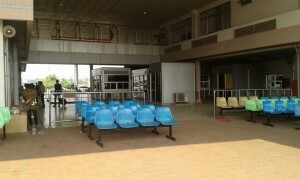 Or if you’re standing on the main road outside the terminal it’s to the right of the front building. There are also a number of budget guesthouses directly at the bus terminal. 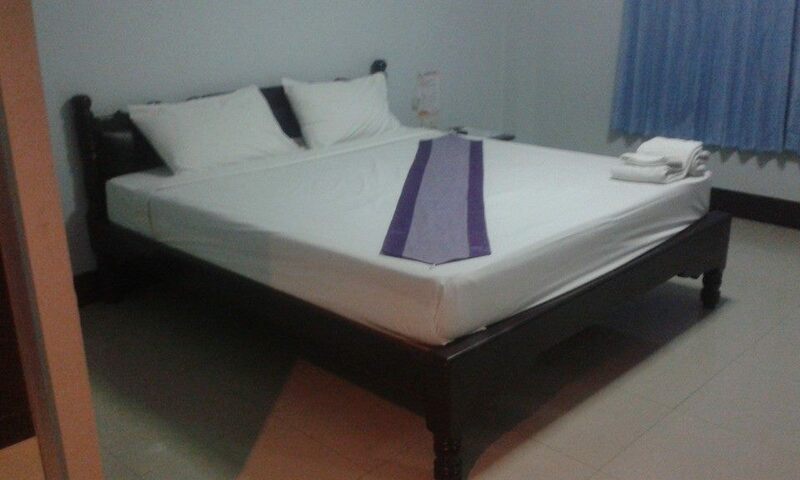 If that’s what you’re looking for – one advertises with fan rooms at 200 Baht per night. If you want to stay in Mukdahan for a day or two before crossing the border to Savannakhet I would recommend, however, to stay in a more central location near the Mekhong riverfront or the so-called Mukdahan Tower, behind which you’ll also find an area with a handful of Thai-style karaoke bars (and available girls – if that’s what you’re looking for). After 16 hours on the bus without virtually anything to eat and only five hours sleep last night, I surely needed a good breakfast to start into the day. 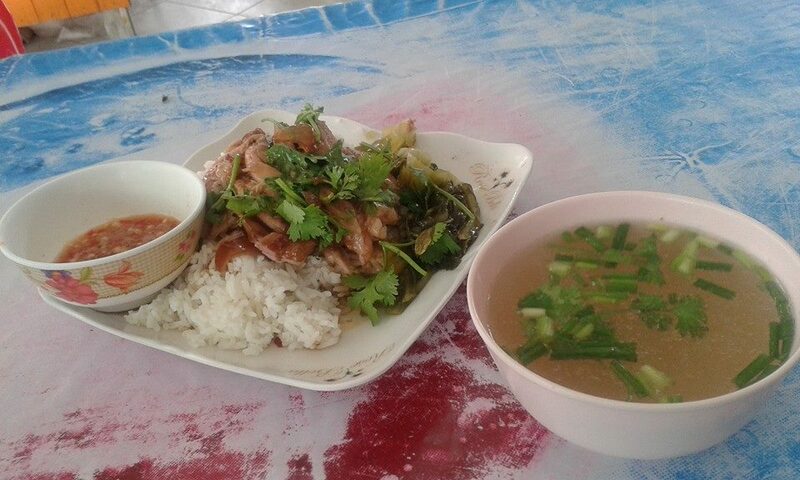 Luckily, I got just that at a Thai restaurant/soup kitchen at the bus terminal in Mukdahan – a large portion of khao kaa moo (rice with pork leg) and a small bowl of clear hot soup. Yummy – and very filling. And now it’s back to “visa run business”. 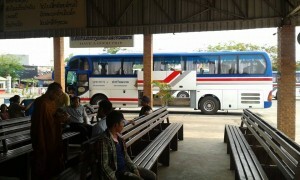 Here’s the so-called “Thai-Lao International Bus” that will take me across the Mekhong river and the Lao border. 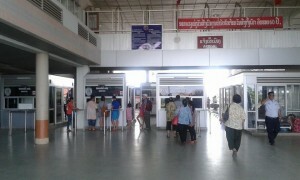 To start with, you’ll need to buy a ticket at 50 Baht at a counter in the ticket hall. 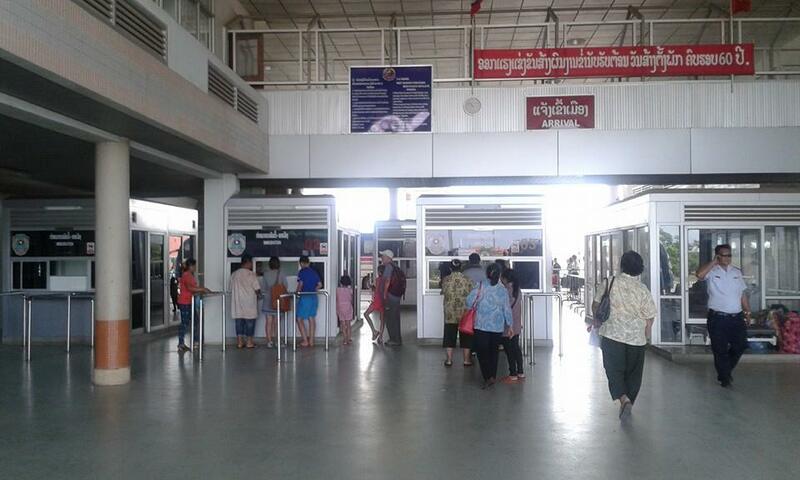 The ticket doesn’t specify a departure time so you can board anytime (just don’t throw it away immediately as you’ll still need it after checking out of Thailand to cross the bridge over to Laos in the same bus). Buses from Mukdahan to the border and Savannakhet leave regularly every hour, starting from approx. 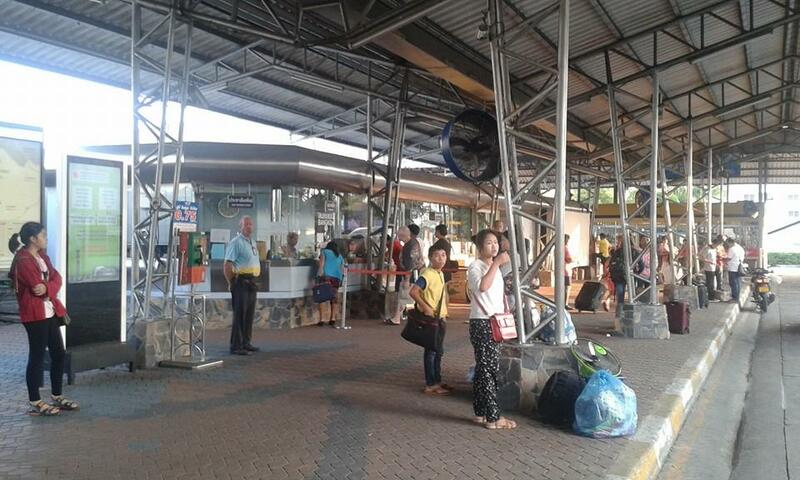 7.30 a.m. I’m taking the 9.30 bus and, once again, I’m the only Farang in a crowd of mostly Lao people who take all sorts of stuff across the border. 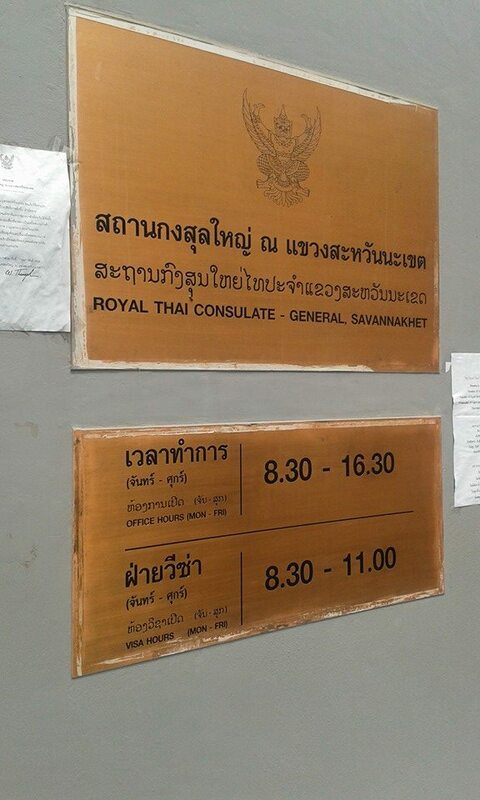 The trip to the Thai border post takes less than 10 minutes, so if there’s no delay at either side of the border I should be at the consulate in Savannekhet just in time before 11 a.m. to apply for a fresh visa. 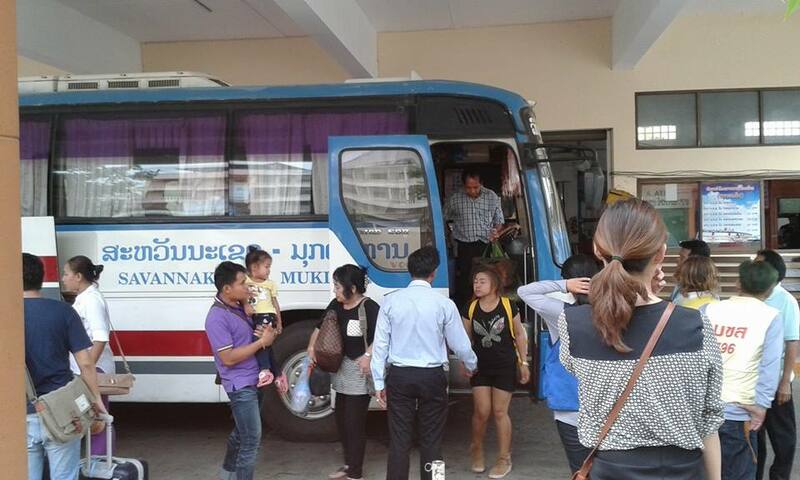 Update – A reader informed us that the last shuttle bus from the Mukdahan border post across the bridge into Laos leaves at 7 p.m., so if you want to spend the day in Mukdahan or, for some other reason, shouldn’t be able to make it to the border in the morning, make sure you get there no later than 7 p.m. as otherwise you might have to spend a(nother) night in Mukdahan! 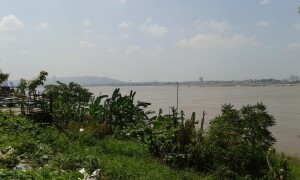 Getting across the second Thai-Lao Friendship Bridge over the Mekhong river and into Laos was as easy and fast as last October. Surprisingly though, only a few Russians, including a family with kids, and a couple of other Farangs appeared out of the blue at this stage, perhaps a sign that Savannakhet is slightly gaining in popularity with visa runners from Thailand? 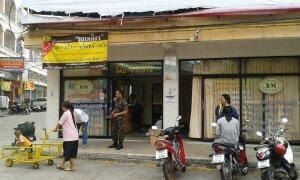 I had my Lao visa on arrival at 10.15 a.m., visa fee 1,500 Baht. All you need is a passport photo and a fully-filled application form, which is available from the guy behind the counter. Don’t forget to fill your entry/exit card either. 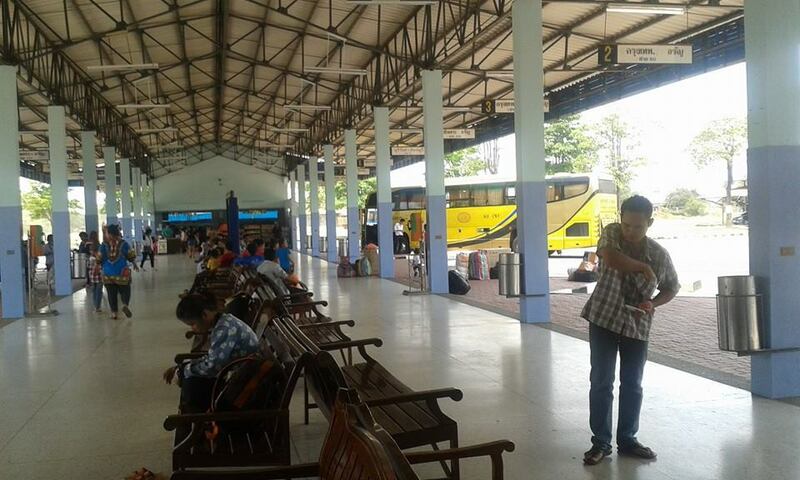 Now in theory you could continue your journey with the same bus to the bus terminal in Savannakhet. That doesn’t make much sense though if you wish to go straight to the Thai consulate, which is located roughly halfway between the bridge and the bus terminal, so you’d have to take a tuktuk back to the consulate and lose precious time. 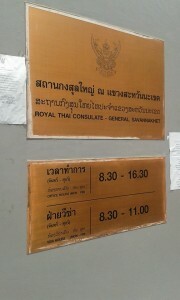 I always opt to sacrifice a bit of extra cash and take a tuktuk or taxi/minivan straight to the Thai consulate. 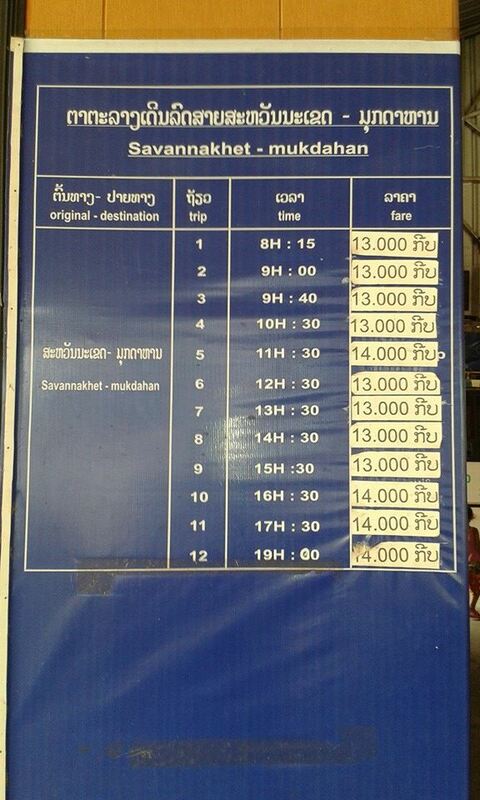 Today I pay 200 Baht for the 10-minute tuktuk ride which is certainly a bit of a rip-off. If you travel in a group or find some other visa runners who want to join you on the trip to the consulate you can always reduce the cost. No problems either at the Thai consulate where I arrived just before 10.30 a.m. My visa application business was finished within less than 20 minutes. To the left of the consulate compound there’s a little shop where you can get your passport copies (10 Baht a copy) or have photos taken for the application form (you need two). If you’re too lazy to fill the application form yourself you can also have some Lao guy do the paperwork for you at a very reasonable fee. 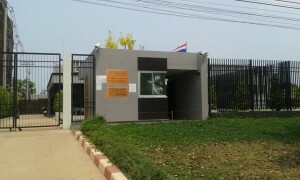 Other than during my first visit last October, there were a handful of Farangs around at the consulate but virtually no waiting time. All you have to do is hand in your passport, a fully-filled application form with two passport photos, and pay the appropriate visa fee (2,000 Baht for a double-entry tourist visa in my case). Note that visa application is only possible until 11 a.m. 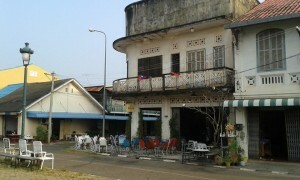 If you arrive later than that you may have to stay an extra night in Laos. Since 2015, you’ll also need to wait one day for your application to be proceeded and can pick up your passport with a fresh visa stamp only the following day from 2 p.m. They will give you a card with a number that you’ll need to produce when you pick up your passport, so make sure you don’t lose that overnight. 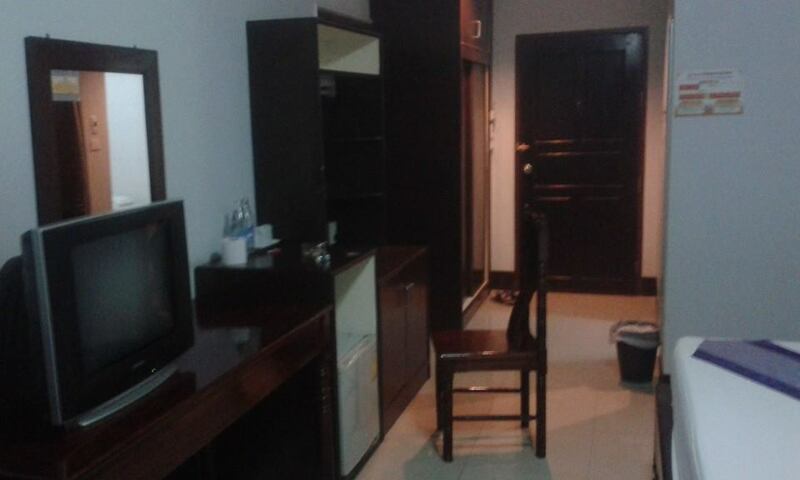 Now that the main business has been done and all you need to do is wait to pick up your visa the next day, it’s time to find a room for the night. It took me another 100 Baht for a tuktuk to the Savanbanhao Hotel which I had booked via Agoda for less than 10 US dollars or something like 300 Baht. Well, the room is basically what I had payed for – budget accommodation at the usual standard you’ll be getting anywhere around Southeast Asia for that price. At least the air-conditioning works as it should, which is worth a lot in this heat. 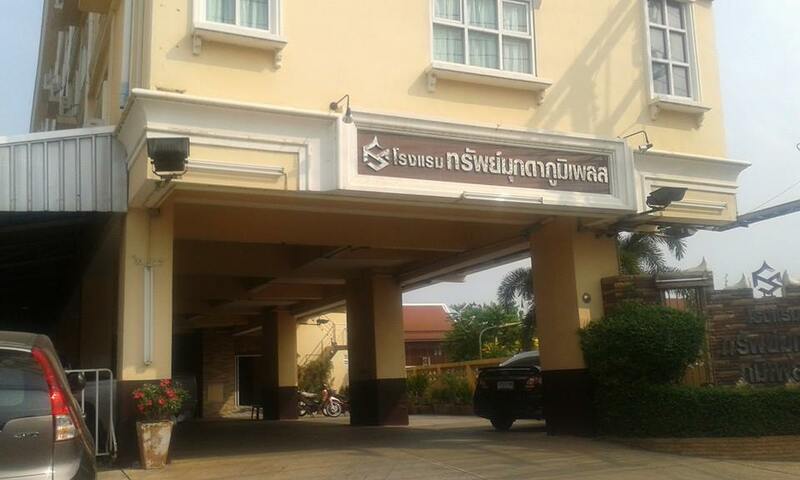 As the hotel is located just a few blocks from the river I’d actually hoped I could pick up the Thai mobile signal from my room – unfortunately not possible. You need to go right to the riverfront to pick up the signal in sufficient quality. An omelette and a lemon juice at the so-called Mekhong restaurant/bar that also does some Western food like steaks and pizzas. 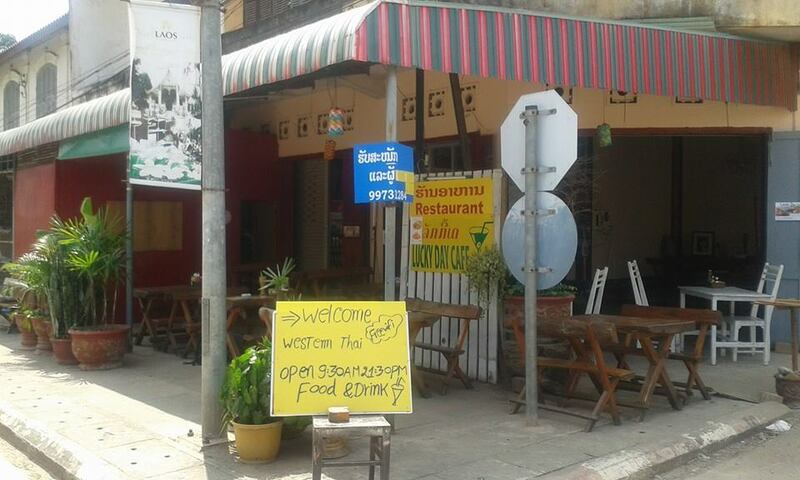 They’ve got WiFi as well but it’s slower than the Thai signal I’m receiving here. The place is part of the Mekhong Hotel where I had stayed during my visit last time; budget rooms at 380 baht a night or so. 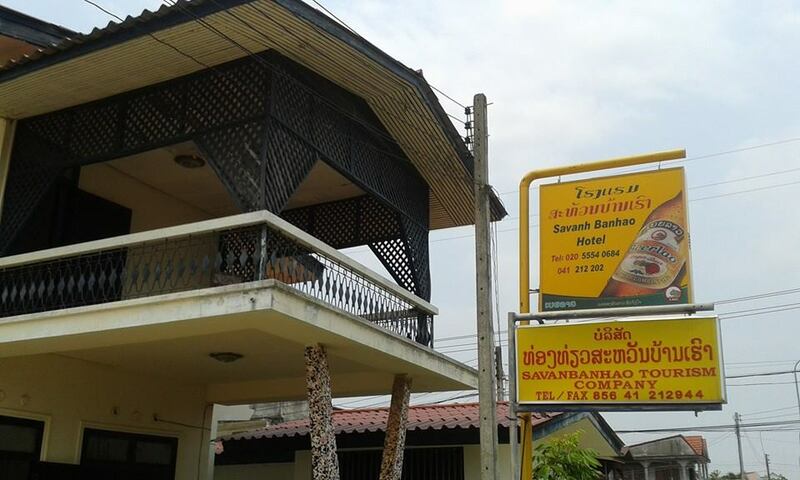 There’s another new three-star hotel just a bit further down the road which is exceedingly popular with frequent visitors to Savannakhet, not least for the prime location right at the riverfront I guess – the New Saen Sabai Hotel which you can also book via Agoda. 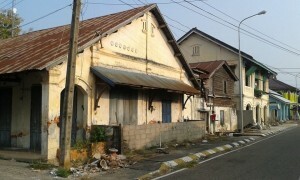 I was initially going to stay there this time but the place was unfortunately fully booked already. 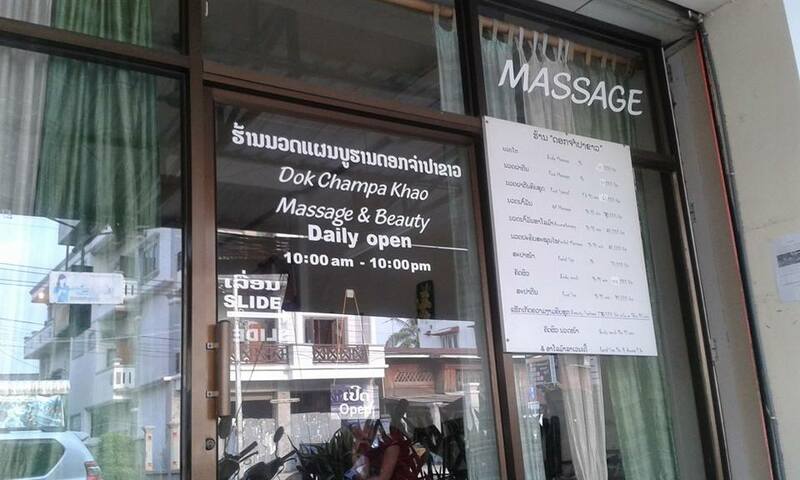 After walking about for over an hour in the heat and humidity of the day and seemingly without a destination, I finally found the air-conditioned oasis I had subconsciously been looking for – a small traditional massage shop just around two corners from my hotel. I got just what I had urgently needed after 16 hours on the bus yesterday – an hour of relaxing bone cracking at 200 Baht or 50,000 Lao Kip. Alternatively, if you wish to explore Savannakhet by day in more detail, just have a look around the “historic old town” and the Mekhong riverfront area. There simply isn’t much more to discover. The pictures embedded in the gallery at the bottom of this post were all taken last October. This time I didn’t bother doing more “sightseeing” and hunting photo opportunities of run-down remains of French colonial architecture. 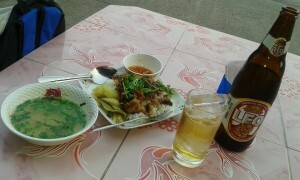 Now it was time for some food and a couple of large Beer Lao again. I had discovered Lisa’s Cafe (or Lisa’s Lucky Day Cafe or something like that) last October and found it to be really the only place worth going here. Once again, I spent most of the evening there, last but not least due to a lack of alternatives. 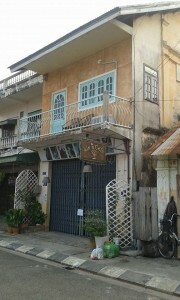 Lisa’s Cafe is located pretty much in the centre of the “historic old town” of Savannakhet, just one block from the riverfront on “second road” so-to-say and opposite the long square (Talaat Yen Plaza), at the end of which you can see the catholic church of Savannakhet. Lisa serves Lao and a bit of Western food, Beer Lao (10,000 kip or 40 Baht for a large bottle), cocktails and other Western-style drinks like Vodka Red Bull. They also have free WiFi and happily provide you with power supply to charge your phone battery, tablet or laptop, if you need to. 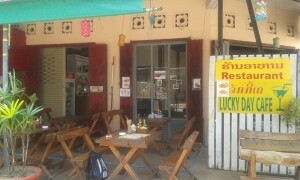 The place is owned by a nice Lao lady named Lisa (or Lita) and her Swedish boyfriend Lasse, who are both great hosts. Lisa speaks decent English and has now also added a snooker-style pool table to the features of the venue, making Lisa’s small corner pub about the only place in town where you can play a game of pool. In addition, you will always find a bunch of interesting people here to have a chat and/or a drink with. Lisa’s Cafe also has a website now with a useful location map: lisa-cafe.weebly.com. 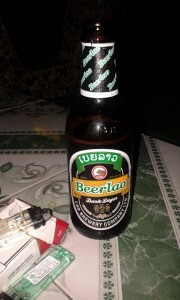 A lonely last bottle of dark Beer Lao at a table outside my guesthouse. Savannakhet after 11 p.m., which seems to be like the official curfew, is just dark and empty streets without people and traffic. Only the odd teenage gang on motorbikes and legions of barking dogs (both stray and “domesticated” ones barking for their lives behind fences) at each and every corner. Even as a dog lover who’s not much afraid of strays I would say that’s hardly an invitation to enjoy the streets of this ghost town by night in whatever further detail there may be. I call it quits for today. Breakfast at Lisa’s Cafe, followed by a last large bottle of yummy Beer Lao. Here’s my plan for today: At 2 p.m. I’ll take a tuktuk to the Thai consulate to pick up my passport, and then it’s back across the border to Mukdahan, from where I’ll continue my journey back to Pattaya by bus. 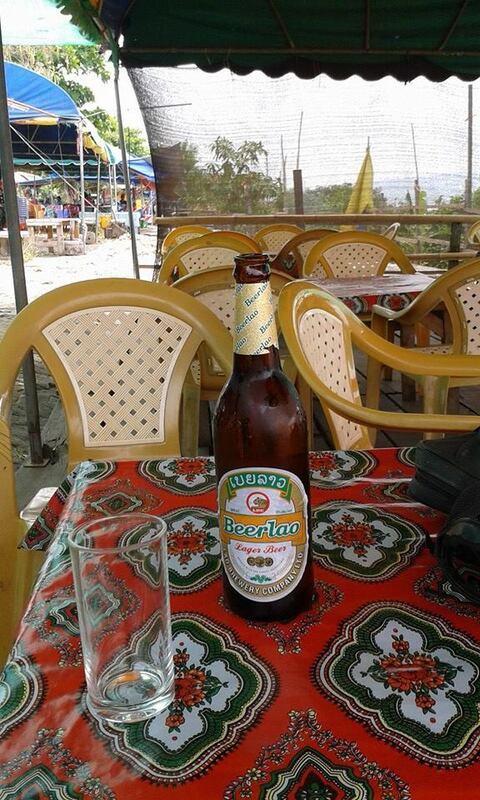 I obviously enjoyed my last Beer Lao for a bit too long and missed the tuktuk that was supposed to pick me up at my hotel at 2 p.m. by about 15 minutes (or he never turned up). Luckily, a guy from the reception at my guesthouse volunteered to take me to the consulate on his motorcycle and then drop me off at the bus terminal for 120 Baht. Deal! 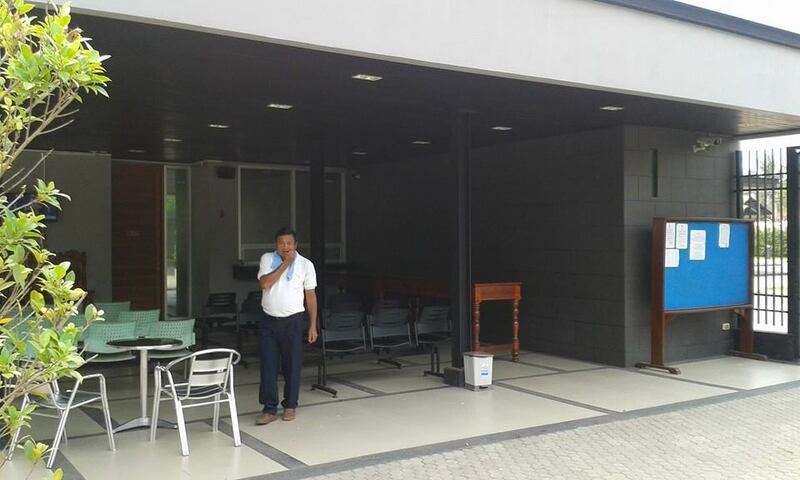 I arrived at the consulate just before 2.30 p.m. and found it completely empty, except for the staff behind the counter and a security guy or so picking his teeth with a finger. It was virtually a matter of seconds until I had my passport including, yep, a brand-new visa sticker. 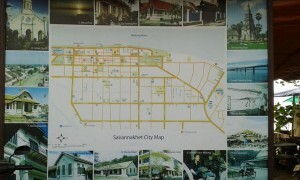 The Savannekhet bus terminal is located roughly between the Thai consulate and the riverfront. If the heat hasn’t killed you yet, it’s actually within walking distance of perhaps 15-20 minutes; alternatively you can charter a tuktuk which shouldn’t cost you more than 100 Baht. 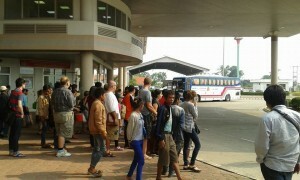 Buses to the border and across the Mekhong river to Mukdahan (bus terminal) leave every hour. The fare is usually 50 Baht or 13,000 Lao kip. I thought i had missed the 2.30 p.m. bus and would have to wait for nearly an hour now. But no, the bus was just a bit delayed and didn’t leave for the border before 2.50 p.m. Lucky me again. 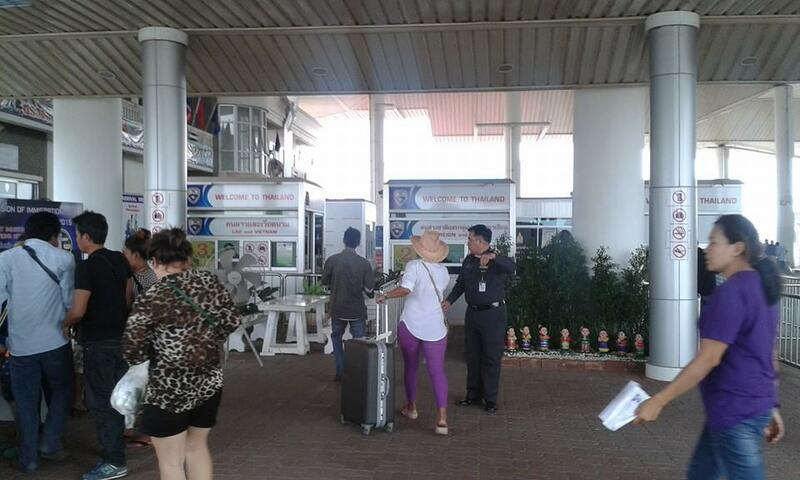 Less than 45 minutes later I was back on Thai soil. 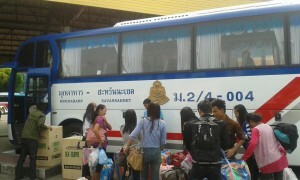 The bus arrived at the Lao border checkpoint just before 3 p.m. and I received my exit stamp within less than two minutes. 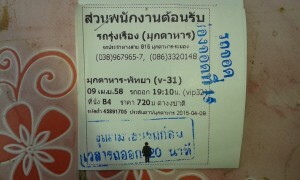 Note: They also charged me some kind of exit fee (40 Baht). Then it’s on the same bus again that will take you across the bridge to the Thai border post. 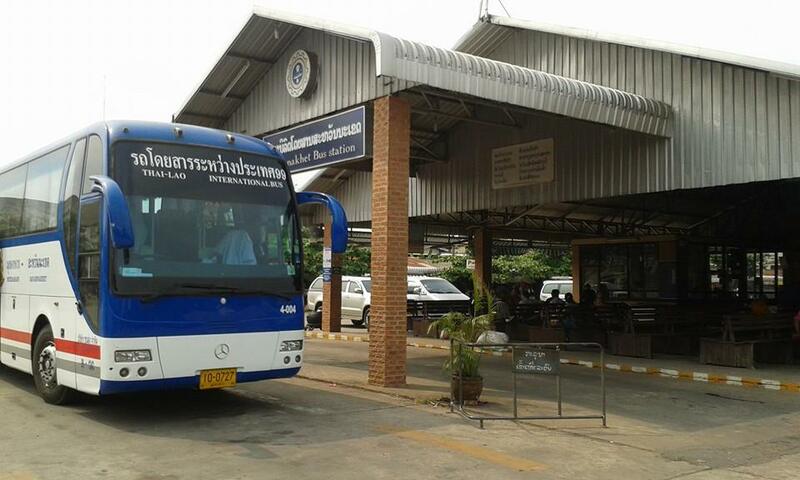 Again the same bus will then take you from the border to the Mukdahan bus terminal. 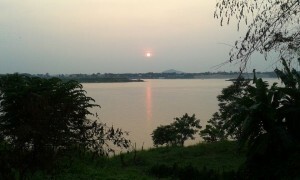 All in all, it took me less than 1 1/2 hours from my guesthouse in Savannakhet back to Mukdahan. 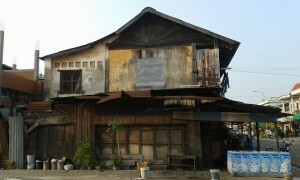 Back in Mukdahan. The bus will drop you off at the front of the bus terminal. The Roong Reuang (yellow bus) ticket office is located in the back of the bus terminal at the left corner. They’ve got a big yellow sign so you can’t really miss it. There are several buses going to Pattaya leaving throughout the afternoon and evening hours. I opt for the 7 p.m. V.I.P. bus at 720 Baht that they say is the fastest and should reach Pattaya not later than 9 a.m. This would make my return journey take “only” 14 hours, two hours less than the other way round on Tuesday, and I hope this isn’t just on paper. 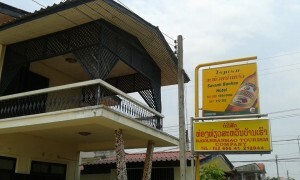 To the left of the “yellow bus” ticket office, there’s also a small Thai massage shop. The place isn’t air-conditioned and the massage is rather mediocre. But if you’ve got plenty of time left before your bus departs and nothing else to do, you might as well just relax here for an hour or two. 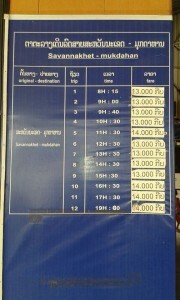 A traditional massage (no extras) costs 150 Baht per hour. That’s the V.I.P. bus scheduled to bring me back home to Pattaya, undeniably a significant upgrade compared with the tin monster that took me here two days ago. The air-conditioning works perfectly and the coach has only 32 seats with just a handful of passengers so far. I spoke with one of the drivers and noted I hoped it wouldn’t rain overnight. There had been heavy rainfall and flooding in Pattaya and Bangkok yesterday and the weather forecast for the next couple of days, including for the northeastern region, didn’t look much more promising. You know, Thai buses and their drivers have a horrible reputation, and bad weather by night doesn’t exactly lift your spirit as a passenger. The driver nodded in agreement, looking as seriously as a Thai can look, and noted it was dangerous and difficult to drive in heavy rain. I found it appeasing to see that at least this guy was fully aware of the risks and as equally concerned as his passenger. 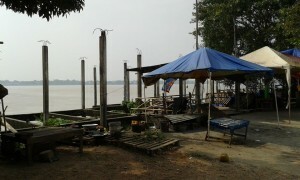 A brief stop and cigarette break at a petrol station somewhere near Chachoengsao. I’ve had a relatively pleasant trip so far. This bus has only 32 seats but less than half as many passengers, including two small kids. I’ve had two seats for myself for the entire journey and at least managed to doze off a few times. Unusual for me on a bus. Hard to believe. I’ve had my eyes closed for just a few minutes I thought when the bus suddenly retards and they call out “Pattaya”. Pattaya?! 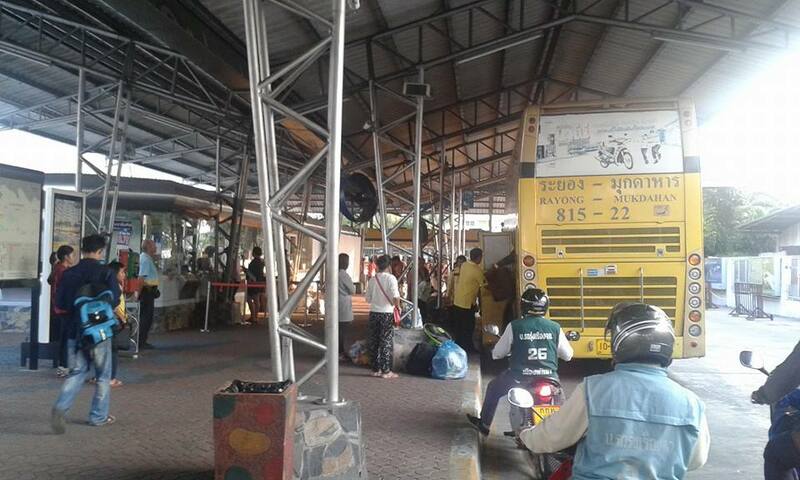 I don’t even recognize it at first but, yep, we’ve just stopped outside the “yellow bus” office at the North Pattaya bus terminal. Two hours earlier than scheduled. It’s only 7 a.m.! This is the end of our trip report. 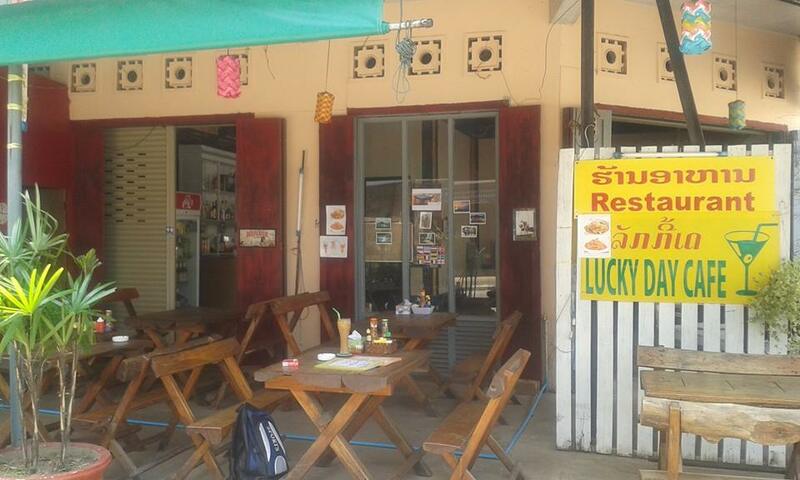 If you’ve been to Savannakhet or Mukdahan yourself and have any important details to add to this post, please feel free to drop us a line or leave a comment at the bottom of this page. As usual, your input is highly appreciated. Cheers. 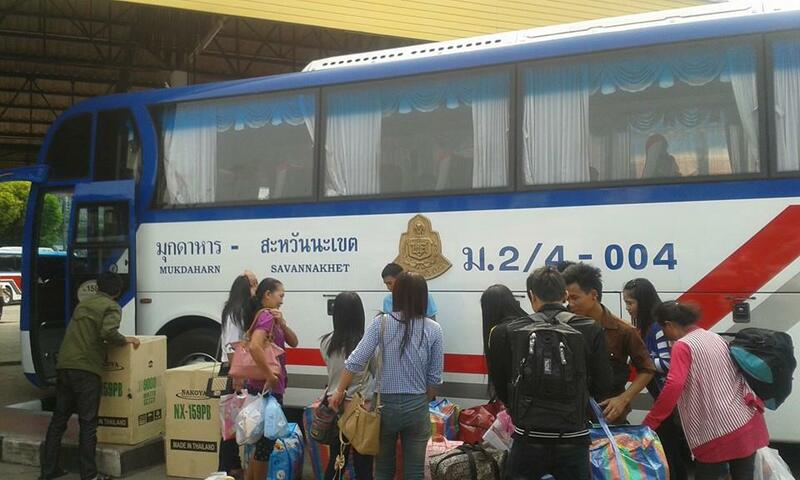 With the benefit of hindsight, I must say I should have booked especially my bus trip to Mukdahan a lot better. Let’s say I felt slightly indisposed a day before I was scheduled to leave (okay, I was hung over and the bus terminal in North Pattaya is at the other end of town from where your webmaster is staying) and paid a motorcycle taxi driver to go and get me a ticket. 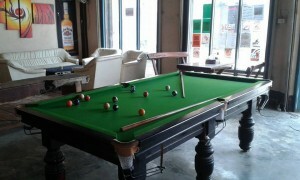 My only requirements were that I wanted to travel by day and depart from Pattaya as early as possible. 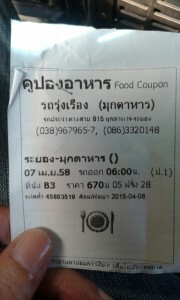 My proxy then returned with a ticket for 8 a.m. the next day which was obviously for an “economic” bus that eventually arrived in Mukdahan after midnight only. My plan had been to have a quick look around Mukdahan on Tuesday night, have a meal and a few beers somewhere before going to bed. Obviously my bus arrived a bit too late for me to execute this plan. 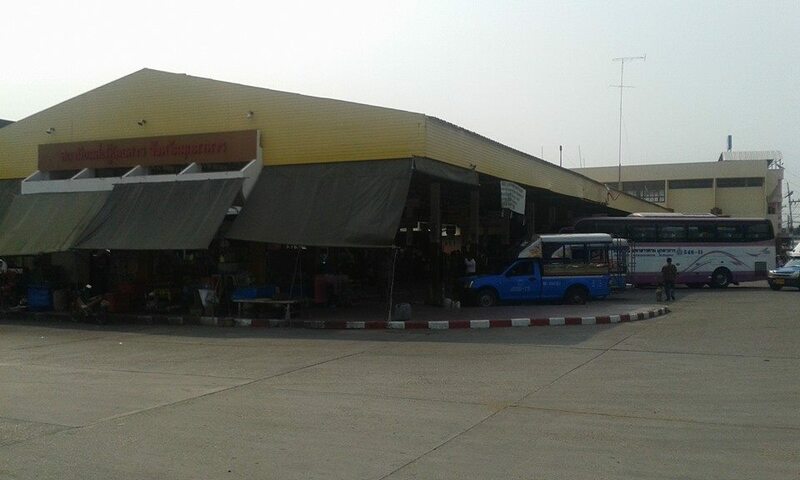 Therefore, if you wish to see a bit of Mukdahan before crossing the border into Laos the next day, the 8 a.m. “economy” bus might not be your best option. It is correct that Mukdahan has no airport. 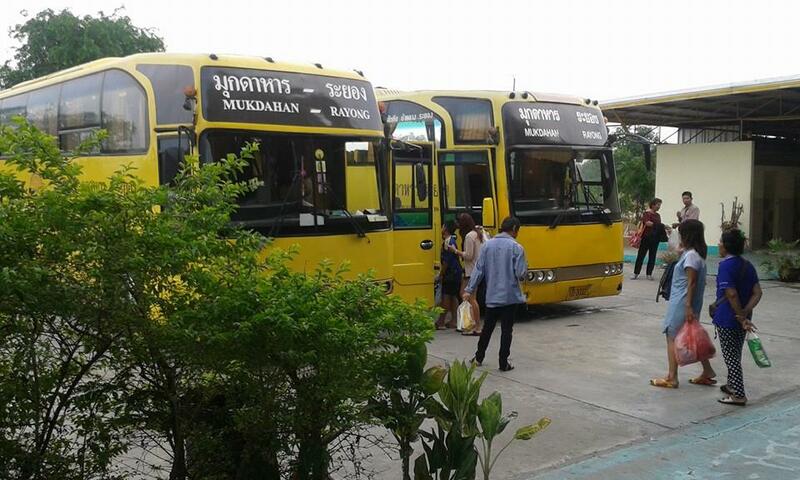 Nok Air and Air Asia, however, do offer a fly/ride service to Mukdahan via Nakhon Phanom from Bangkok. 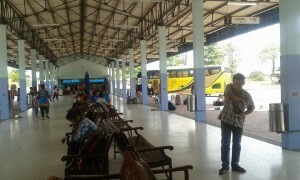 A Swedish guy who visits Savannakhet regularly confirmed to us that the two-hour minivan transfer from Nakhon Phanom to Mukdahan was included in the fare, so you can actually get from Bangkok’s old Don Mueang Airport to Mukdahan in only three hours (add an additional three hours for getting from Pattaya to the airport in time). 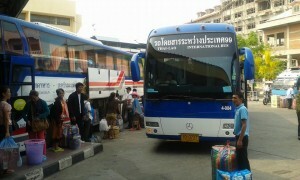 The fares start at just above 1,000 Baht so aren’t much more expensive than a bus ticket. Here are some pictures in random order taken during our first visit to Savannekhet in October 2014. Not much had changed this time. 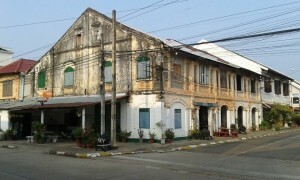 Savannakhet by day as well as by night remains a friendly yet sleepy ghost town in ruins whose only real highlight the Thai consulate is. 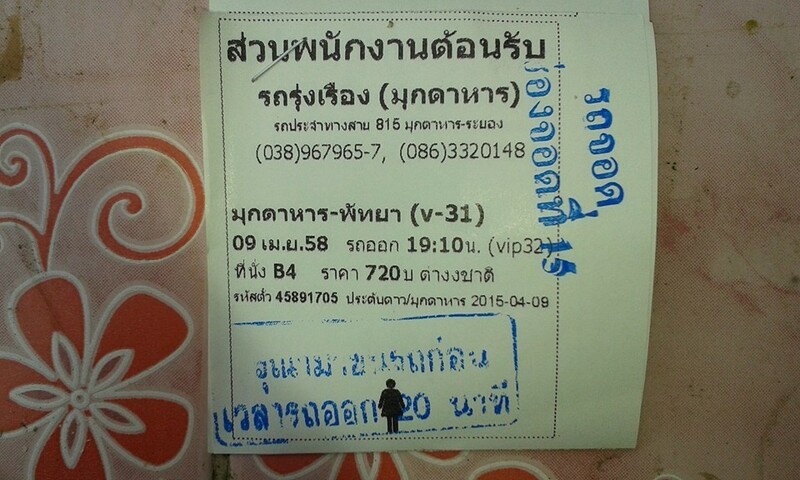 I got the 6:30pm VIP bus from Mukdahan to Pattaya, rather than the 7:00pm one. According to the website, they take the same amount of time. It’s a brutal ride if you can’t sleep on buses, like me. I’d never do it again. One important thing you neglected to mention is that the last bus from the border in Mukdahan across the bridge into Laos is at 7:00pm. Yes, you are right – Savannakhet is full of angry, feral, foaming at the mouth dogs. I had a couple of confrontations. They don’t back down. Fortunately I found a communist flag which I used to fend them off. They are not the lazy, constantly sleeping dogs you find in Thailand. They are aggressive and don’t like foreigners. 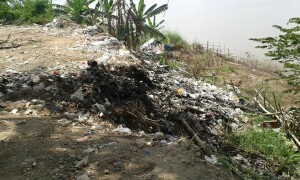 Thanks for your quick report and update on a few things. I’ve added your piece of extra information re: the last bus crossing the bridge to the post now. By the way, did you find any places worth visiting in the night, on either side of the border? 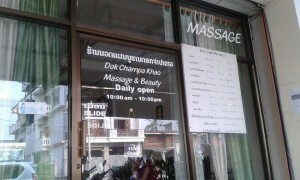 Like you, I went and got a massage while waiting for the Yellow Bus back from the Mukdahan terminal to Pattaya. Flights back to DMK via Air Asia were sold out. 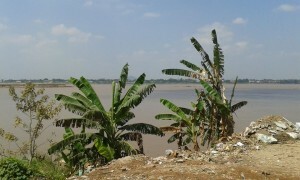 I could have spent a night in Mukdahan and flown back the next day, but decided to bus it, so didn’t end up spending a night in Mukdahan, so I have no idea whether there is anything worth doing at night there. 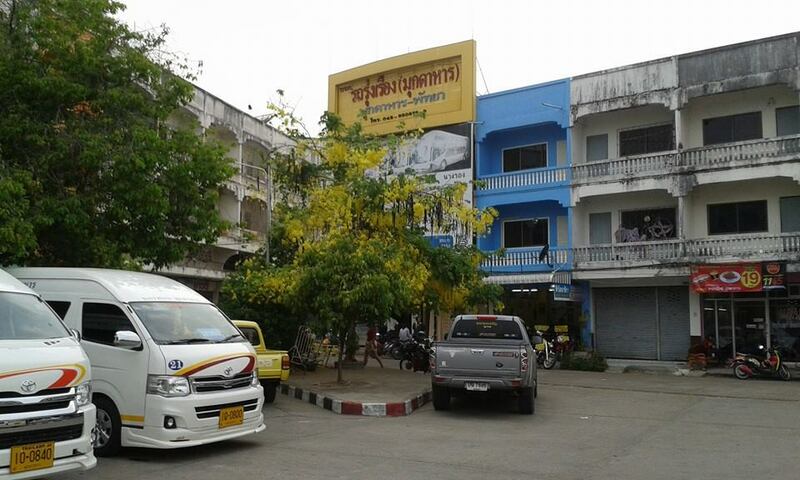 I arrived in Savannakhet on the last bus across the border on the Sunday night and went straight to a hotel to sleep, and wake up to head to the Thai consulate first thing Monday morning. 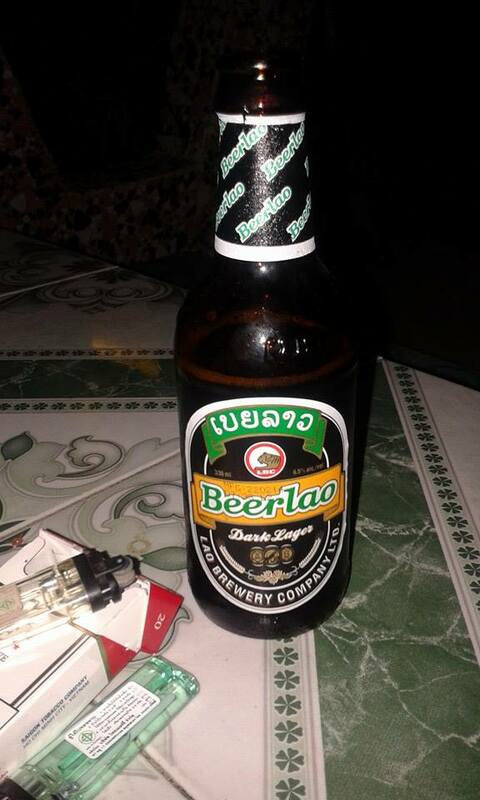 Had another early night on Monday night and picked up the visa at 2pm on Tuesday and immediately went about getting out of Laos, so again, I can’t comment personally on whether there is anything to do at night. There is a casino there, so maybe that is something that will keep some people entertained. 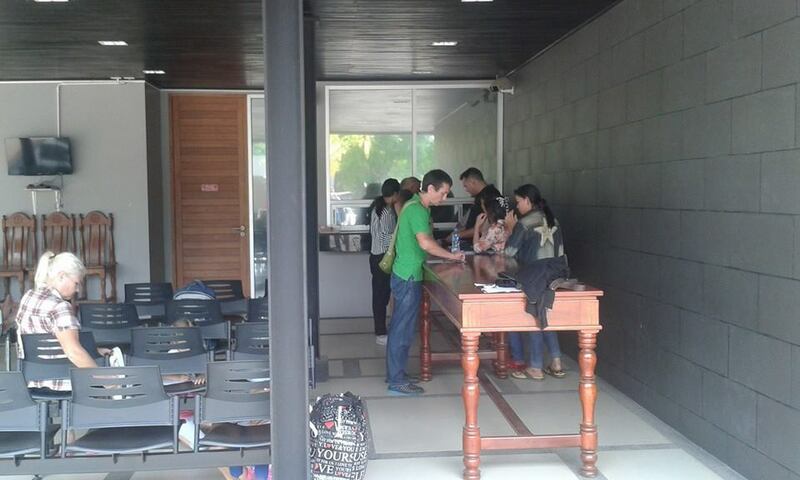 There is a little coffee shop next to the Thai consulate with free wifi where other visa runners are waiting for the consulate to open to pick up their passports. Most hotels will want you out at midday, so it’s a good place to wait from midday til 2pm when the consulate opens. Yes, the Thai consulate has apparently moved to a new location sometime last year and is now closer to Friendship bridge, so unfortunately also further away from the river and the “city centre” so-to say.